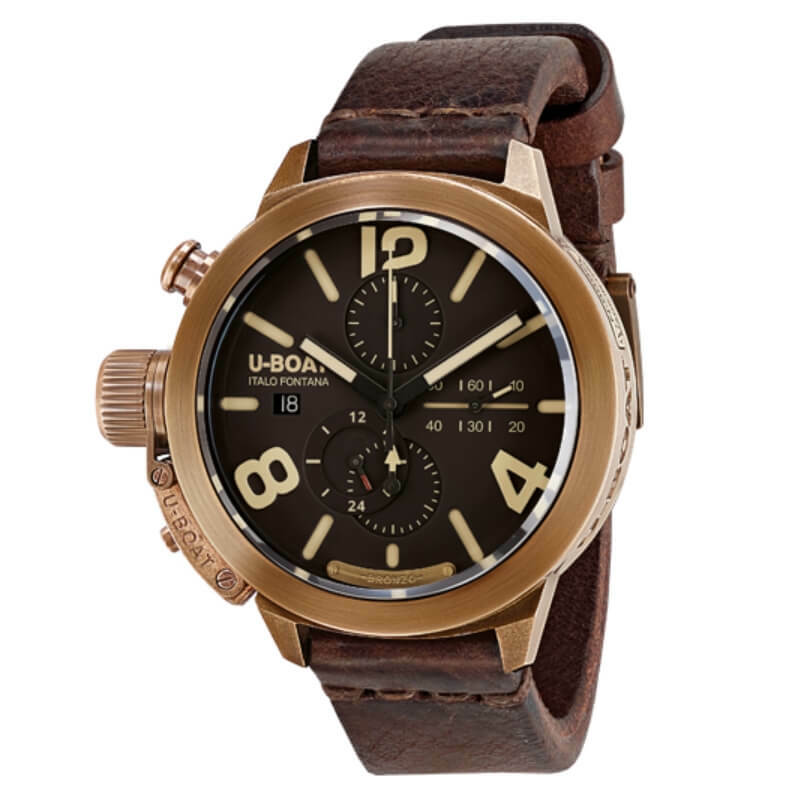 The Classico 45 Bronzo features a rugged, military-inspired style that draws upon U-Boat’s design heritage more than any of U-Boat’s other watches. You could easily imagine this watch on the wrist of a naval aviator or at the helm of a ship – the use of naturally aged bronze calls to mind vintage sextants, compasses, and the like. as it wears, ages, and even corrodes. As a result, no two watches are identical, and eventually each will reflect how it was used and worn throughout it’s life, creating a one-of-a-kind heirloom piece. Diameter 45 mm. Serial number engraved on a small plate fixed on the side of the case. Brown. Beige Arabic numerals, beige hands and markers, treated with superluminova. Hand of 24h indicator in red colour. Hand made and hand finished calf leather, bronze tongue buckle. Width 20/20 mm. The untreated bronze has a natural changing of its shades with time, this makes each watch completely original and one of a kind with a natural vintage appearance.